In October 2015, the first of three planned configurations of the Space Launch System (“SLS”) successfully completed NASA’s Critical Design Review, a full-system test to determine whether the design is ready for full-scale adaptation, construction, and assembly. This was a major milestone for the SLS program, becoming the first human-rated space delivery system to pass this test in almost 40 years. Shortly thereafter, in December 2015, NASA’s Kennedy Space Center in Florida also passed the Critical Design Review for its ground facilities that will support SLS launch activities. While SLS is still far from launching its inaugural test flight, these major milestones demonstrated that the program was making incremental steps toward its goal of launching America back out into deep space. shall be designed to have, at a minimum, the following: (A) The initial capability of the core elements, without an upper stage, of lifting payloads weighing between 70 tons and 100 tons into low-Earth orbit in preparation for transit for missions beyond low-Earth orbit. (B) The capability to carry an integrated upper Earth departure stage bringing the total lift capability of the Space Launch System to 130 tons or more. (C) The capability to lift the multipurpose crew vehicle. (D) The capability to serve as a backup system for supplying and supporting ISS cargo requirements or crew delivery requirements not otherwise met by available commercial or partner-supplied vehicles. It is very unusual to see this level of granularity in an authorization bill. After all, designing the SLS is quite literally rocket science and is best left to the experts of NASA rather than policy planners on Congressional Hill. However, working with these very detailed design specifications and after tinkering with several different configurations, NASA was ultimately able to come up with three configurations, Block 1, Block 1B, and Block 2, that will achieve these Congressional goals. While each of these block designs is slightly different, all of the configurations contain several common components. All three of the currently planned SLS configurations will have the same core stage design. Towering at more than 200 feet or 60 meter, the SLS’s core stage has a diameter of around 27 feet or 8 meter. The core stage will contain cryogenic liquid hydrogen and liquid oxygen that will serve as the fuel for the four RS-25 engines attached to it. The core stage is being manufactured at NASA’s Michoud Assembly Facility in New Orleans and the Boeing Company is the prime contractor for its construction. The core stage will be tested and certified at NASA’s Stennis Space Center near Bay St. Louis, Mississippi, where the original Saturn rockets were tested for the Apollo missions to the Moon. All of SLS’s avionics equipment and electronics will be housed in the core stage and is currently being developed and certified at NASA’s Marshall Space Flight Center in Huntsville, Alabama. Four RS-25 liquid propellant engines attached to the core stage will, along with the rocket boosters, help power the SLS. These RS-25s are the same engines that powered the Space Shuttle. Built by Aerojet Rocketdyne, 16 RS-25 engines are currently available for use by the SLS Program. The SLS's RS-25 engines will be operated at 109 percent thrust rather than the 104 percent thrust level that was used for the Space Shuttle. Each of the RS-25 engines can provide 512,000 pounds of vacuum thrust at full throttle. Future RS-25 engines will be manufactured with the aid of a 3-D printing technology called selective laser melting, which will help reduce cost and increase reliability of these engines by reducing the need of welded parts. The core stage along with the four RS-25 engines will have an empty mass of about 187,990 pounds or 85,000 kilograms and a gross mass of about 2,100,000 pounds or 980,000 kilograms. 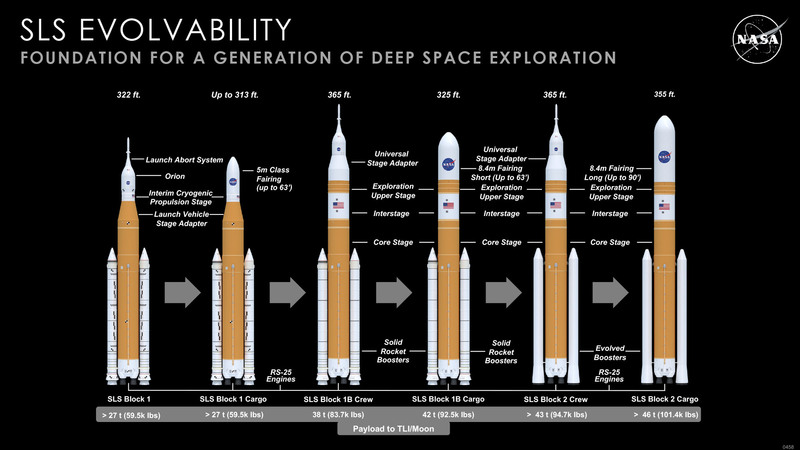 Both Block 1 and Block 1B of the SLS will also be powered by two five-segment Solid Rocket Boosters (“SRBs”). Each of these boosters will be 177 feet long and 12 feet in diameter, and weight about 1.6 million pounds. The SRBs will use polybutadiene acrylonitrile (PBAN) as the propellant, which will generate 3.6 million pounds of thrust each with an operational, or burn, time of 126 seconds. Essentially, each of these SRBs will generate more thrust than 14 four-engine commercial jumbo jets combined. The design of these SRBs is based on the four-segment Space Shuttle SRBs, with an additional propellant segment added to provide approximately 25% more total impulse. One other difference is that, unlike the Space Shuttle SRBs, the SLS SRBs are designed for single-use only. Orbital ATK is manufacturing these SRBs in Utah. The completed SRBs will be shipped by rail to NASA’s Kennedy Space Center in Florida for final assembly with the rest of the components for the SLS. Once assembled, the SRBs will carry SLS's full weight on the launchpad while waiting for lift-off. For Block 2, NASA is still largely in research and development phrase; NASA will be developing an advanced booster that will enable SLS to achieve its maximum launch mandates. While working with industry leaders in designing this next-generation booster, NASA anticipates using the five-segment SRB design until at least late 2020s. Block 1, the initial configuration of the SLS, will contain the Core Stage, four RS-25 engines along with two five-segment SRBs. In addition, Block 1 will also use an Interim Cryogenic Propulsion Stage (“ICPS”) as its upper stage. This upper stage is a modification of the Delta Cryogenic Second Stage that is used in the United Launch Alliance’s Delta IV rocket, and will be powered by one RL10B-2 engine designed by Aerojet Rocketdyne. The Orion crew vehicle will complete this configuration by sitting on top of the ICPS. Block 1 will weigh 5.75 million pounds fully fueled and stand at 322 feet tall. It will be able to launch 70 metric tons (77 tons or 154,000 pounds), carrying more than three times the mass of the Space Shuttle. At liftoff, it will produce over 39,144 kilonewtons (8.8 million pounds) of thrust. Block 1 is scheduled to fly SLS's first mission, Exploration Mission-1 (“EM-1”). Both the Block 1B Crew version and the Cargo version will have similar configurations as Block 1, but instead of using the ICPS as their upper stage, both will use a newly-designed Exploration Upper Stage (“EUS”). The EUS will have a diameter of 27.6 feet and be powered by four RL-10 engines designed by Aerojet Rocketdyne. This stage is also being constructed at NASA’s Michoud Assembly Facility. The Orion crew vehicle will be placed on top of the EUS for the Block 1B Crew configuration and a Cargo Fairing will be attached to the EUS for the Block 1B Cargo configuration. Block 1B Crew is expected to stand at 364 feet whereas Block 1B Cargo is expected to stand at 327 feet. Both are anticipated to lift 105 metric tons (115 tons or over 230,000 pounds). Block 1B Cargo will make its maiden voyage on the Europa Clipper Mission and Block 1B Crew will be inaugurated on Exploration Mission-2 (“EM-2”). Similar to Blocks 1 and 1B, Block 2 of the SLS will contain the Core Stage and four RS-25 engines. However, the five-segment SRBs will be replaced by the to-be-developed advanced boosters which will enable SLS to achieve its mandated launch capacity of more than 130 metric tons (143 tons or over 280,000 pounds). At liftoff, this configuration will produce over 40,923 kilonewtons (9.2 million pounds) of thrust. Block 2 will also use EUS as its upper stage with four RL-10 engines attached. Depending on mission criteria, either the Orion crew vehicle or a Cargo Fairing component will sit on top of the EUS. Block 2 Cargo configuration is expected to stand at 365 feet. Block 2 Crew version should make its debut on Exploration Mission-9 (“EM-9”) and the Cargo version on Exploration Mission-10 (“EM-10”).